It’s not always easy to build loyalty with your clients in the real estate business — or any business for that matter. Building loyalty takes time and there are a number of essential things that you should be doing. 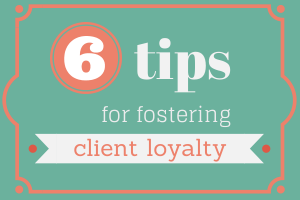 Here are six practical tips you can use to foster client loyalty. Events such as client appreciation days and seminars can be fantastic loyalty-builders. Both of these events are not only great for strengthening relationships with your clients, they’ll also help you get introduced to more people (potential real estate leads) if you encourage your clients to bring friends and family members along. A client appreciation event can be anything from bowling to a barbecue to a fireworks show. And remember that seminars are perfect for positioning yourself as a “home expert” because the purpose of the seminar will be to educate your clients on any number of topics relating to homeownership. You can conduct the seminar yourself or invite an expert in to speak. It could be an interior designer, hardwood flooring specialist or any other professional who can offer valuable advice your sphere would be interested in. In addition to a real estate newsletter or e-newsletter being a great keep-in-touch tool, it’s a powerful instrument for establishing trust, credibility and expertise. It’s important for the e-newsletter to include helpful and interesting information such as how to assess the value of one’s home, advice for boosting curb appeal, and more. A good real estate customer relationship management (CRM) platform will come with a professionally designed and written monthly e-newsletter so you don’t have to spend the money, or take the time, to create one each month. It is a good idea to meet with clients occasionally to do a homeowner’s checkup. You can provide current information and available services such as a local market update, a simple inspection of their home, a review of their current mortgage, and more. These checkups are also good opportunities to have a discussion about the client’s home goals. As this type of meeting can be time-consuming, I recommend you offer this to only your best clients (your “A list”). Again, this is something you’d do for only your top clients, but after meeting with them face to face, phone calls are the next best thing from a relationship-building standpoint. Schedule quarterly “keep-in-touch calls” and after the call, record in your real estate CRM what you spoke about. This is important because next time you talk with that client, you can ask how Jimmy’s baseball tournament or Mary’s surgery went. During these calls, you can also offer recommendations on reputable home professionals, which is a win-win-win situation. Showing genuine interest in your clients’ lives is instrumental to relationship-building, and of course developing a referrals-based business. These days, a handwritten card is rare, which is why you should send them out to express your appreciation each time you get a referral. In the card, thank the referrer, mention that you rely on referrals to build your business, and promise to take good care of the person he referred. You’ll also want to keep the referrer in the loop and let him know the outcome of the person he referred. Keep track of these key dates in your real estate CRM so when a birthday or home purchase anniversary arises, the system will remind you to contact your client. You may want to send a card and a small gift. Most agents don’t do this and most clients don’t expect it, so when it is done, it’s truly a “wow” experience. And it’s another excellent way to stay top of mind and memorable with your clients over time. When all’s said and done, loyalty is something that can be built up over time if you do the right things. Of course, the foundation to loyalty is providing an exceptional service experience for your clients. I hope that you will put some or all of these ideas into practice and that you find these tips helpful in improving your business.